This is an entertaining and elegantly written story about social class, self-delusion and the fragility of second chances. Its title makes it sound like a thriller or the series finale of The Love Boat, but The Last Cruise is no mere lightweight literary vessel. The Queen Isabella is a 1950s vintage ocean liner that's making one final voyage — a two-week jaunt from Los Angeles to Hawaii — before lowering anchor at the scrapyard. The company that owns the ship, Cabaret Cruise Lines, has decided to cash in big by offering a luxury cruise that evokes the spirit of 1957, when the ship was launched. No Internet and no kids are allowed on board; instead, there are lounge singers aplenty and menus dating from the golden age of Hollandaise sauce featuring eggs Benedict and lobster Newburg. From its martinis and highballs to its faded gold wallpaper, The Queen Isabella is a floating "theater of nostalgia." Christensen populates the liner with a passenger and crew list every bit as intoxicating as those retro cocktails: Among them are Christine Thorne, a 30-something former magazine writer now settled into a dull marriage to a Maine farmer. Christine's been invited along by her friend Valerie, who's a tough New York journalist researching a book about "the shadowy world of hidden workers in the new global economy." Valerie is determined to descend below deck to interview room stewards, dishwashers and cooks. There were no windows in the galley. Giant vents sucked up the smoke and circulated the air, but they couldn't do much when the kitchen was in full swing. ... The air was so thick and wet, Mick felt as if he were breathing hot seawater. The atmosphere heats up further when the workers on board — many of them from developing countries — learn that the Cabaret Cruise line plans to terminate their contracts at the end of the voyage, rather than trying to transfer them to other ships. Soon after, a fire (that may or may not be arson) breaks out in the engine room, leaving the Queen Isabella floating dead in the water. Add to that an outbreak of norovirus, and you've got, well, I have to say it, a perfect storm of a plot in which the vertical borders between the privileged and the proletariat collapse. "I see my ... chapter as an answer to David Foster Wallace's snarky essay [on cruise ships], which frankly hasn't aged well." Christine laughed; this was so like Valerie, to appropriate the work of writers she admired while bragging that she would write something better. Close quarters exert a different influence when Christine volunteers to help Mick cook after most of his galley crew quits in protest of their impending termination. Mick realizes with self-disgust, that even though he's smitten with Christine, he's a hesitant personality. As Mick reflects: "He wasn't capable of taking action beyond the bounds of his place in the world." Strange to say, all the while I was reading The Last Cruise I kept thinking of Barbara Pym, another novelist who also wrote astute novels about contained worlds. Like Pym — who has been described as the most under-rated writer of the 20th century — Christensen is easy to misjudge, but, as she demonstrates in The Last Cruise she's quite capable of navigating deep waters. This is FRESH AIR. Kate Christensen is the author of seven novels, one of which, "The Great Man," won the PEN/Faulkner Award for Fiction. Her new novel is called "The Last Cruise," and our book critic Maureen Corrigan says its story charts an unexpected course. MAUREEN CORRIGAN, BYLINE: It's a rusty old bucket of a plot contrivance. Throw a bunch of strangers together on a boat and roil the waters with a big storm or a white whale. But in her latest novel, "The Last Cruise," Kate Christensen demonstrates there's life yet to be found in what may appear to be the creakiest of fictional premises. This is an entertaining and elegantly written story about social class, self-delusion and the fragility of second chances. Its title makes it sound like a thriller or the series finale of "The Love Boat." But "The Last Cruise" is no mere lightweight literary vessel. The Queen Isabella is a 1950s vintage ocean liner that's making one final voyage, a two-week jaunt from Los Angeles to Hawaii before lowering anchor at the scrapyard. The company that owns the ship, Cabaret Cruise Lines, has decided to cash in big by offering a luxury cruise that evokes the spirit of 1957, when the ship was launched - no Internet and no kids allowed on board. Instead, there are lounge singers aplenty and menus dating from the golden age of hollandaise sauce, featuring eggs Benedict and lobster Newberg. From its martinis and highballs to its faded gold wallpaper, the Queen Isabella is a floating theater of nostalgia. Christensen populates the liner with a passenger and crew list every bit as intoxicating as those retro cocktails. Among them are Christine Thorne, a 30-something former magazine writer now settled into a dull marriage to a Maine farmer. She's been invited along by her friend Valerie, who's a tough New York journalist researching a book about the shadowy world of hidden workers in the new economy. Valerie is determined to descend below deck to interview room stewards, dishwashers and cooks. One of those cooks is a Hungarian executive sous chef named Mick Szabo. Through Mick, we get an entree into the high-pressure world of the galley, where those nightly feasts are prepared. Here's a quick descriptive taste. (Reading) The main galley roared and clanked. The air vibrated with heat. In the midst of a controlled chaos, Mick wrestled a gigantic tray of briskets into an oven and turned to a 40-quart pot of simmering beef stock. There were no windows in the galley. Giant vents sucked up the smoke and circulated the air, but they couldn't do much when the kitchen was in full swing. The air was so thick and wet, Mick felt as if he were breathing seawater. The atmosphere heats up further when the workers on board, many of them from developing countries, learn that Cabaret Cruise Lines plans to terminate their contracts at the end of the voyage. Soon after, a fire that may or may not be arson breaks out in the engine room, leaving the Queen Isabella floating dead in the water. Add to that an outbreak of norovirus, and you've got - well, I have to say it - a perfect storm of a plot in which the vertical borders between the privileged and the proletariat collapse. Christensen is a sharp observer, not only of the layered social world of the Queen Isabella, but of the shifting relationships between her characters. For instance, the tiny cabin that Christine and Valerie share strains their friendship, making Christine more alert to her friend's pretensions. When Christine asks Valerie why she didn't go undercover as a worker to research her book like Barbara Ehrenreich did in her classic "Nickel And Dimed," Valerie responds, I see my chapter as an answer to David Foster Wallace's snarky essay on cruise ships, which frankly hasn't aged well. Christine laughed and thought to herself, this was so like Valerie to appropriate the work of writers she admired while bragging that she would write something better. Close quarters exert a different influence when Christine volunteers to help Mick cook after most of his galley crew quits in protest of their impending termination. Mick realizes with self-disgust that even though he's smitten with Christine, he's a hesitant personality. As Mick reflects, he wasn't capable of taking action beyond the bounds of his place in the world. Strange to say, all the while I was reading "The Last Cruise," I kept thinking of Barbara Pym, another novelist who also wrote astute novels about contained worlds. Like Pym, who was famously nominated as the most underrated writer of the 20th century, Christensen is easy to misjudge. But as she demonstrates in "The Last Cruise," she is quite capable of navigating deep waters. GROSS: Maureen Corrigan teaches literature at Georgetown University. 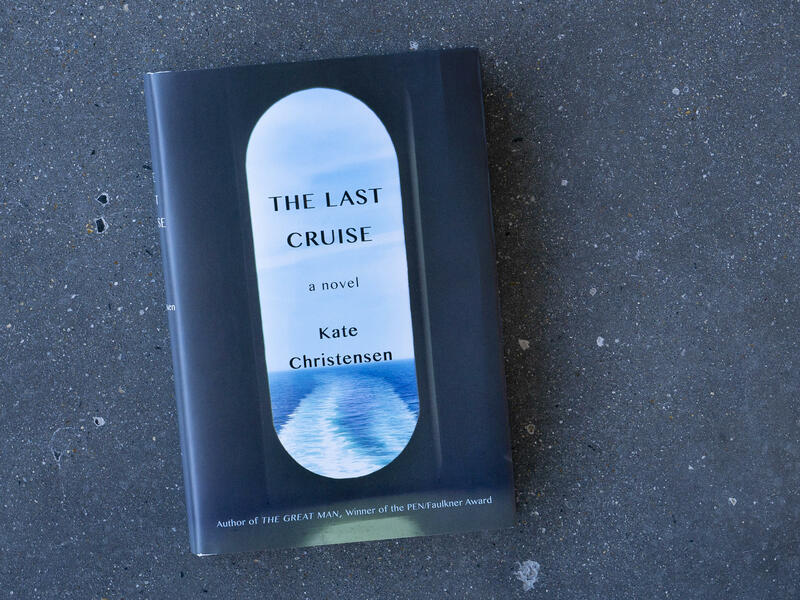 She reviewed "The Last Cruise" by Kate Christensen. If you'd like to catch up on FRESH AIR interviews you missed, like this week's interviews with comic satirical songwriter Bo Burnham, who wrote and directed the new film "Eighth Grade," and with Viv Albertine, who was in the punk band the Slits and has a new memoir, check out our podcast. You'll find lots of our interviews. Fresh AIR's executive producer is Danny Miller. Our interviews and reviews are produced and edited by Amy Salit, Phyllis Myers, Roberta Shorrock, Sam Briger, Lauren Krenzel, Heidi Saman, Therese Madden, Mooj Zadie and Seth Kelley. Thea Chaloner directed today's show. I'm Terry Gross. Transcript provided by NPR, Copyright NPR.